War of the Spark is almost here, and while a lot of the focus has been on the planeswalkers, there are some sweet non-planeswalker cards in the set as well. Today, thanks to Wizards being kind enough to hook us up with a preview, I've got one to show off for all of you! While not a planeswalker, it is a returning character. 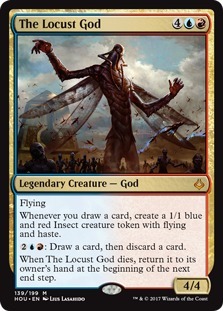 In fact, this is the third time this legendary creature has shown up since Amonkhet. Meet the newest version of Neheb: Neheb, Dreadhorde Champion! In some ways, Neheb, Dreadhorde Champion calls back to Neheb, the Eternal, offering a way to add mana that involves dealing damage, but Neheb, Dreadhorde Champion trades in the ability to make truly massive amounts of mana and some combo potential for the ability to rummage away bad cards in our hand to dig for action. In the dream scenario, Neheb, Dreadhorde Champion is sort of a repeatable self-Wheel of Fortune with a Seething Song or two thrown in for good measure. 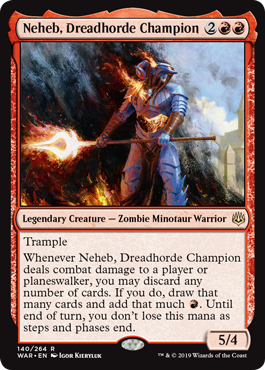 Although more often, Neheb, Dreadhorde Champion will be more like a repeatable free Cathartic Reunion or Tormenting Voice melded with a Rite of Flame, allowing us to discard our worst card or two and turn them into something fresh from our deck. More importantly, this value comes attached to a solid 5/4 trampling body for just four mana, making it solid based on stats alone. As far as making Neheb, Dreadhorde Champion work, it's actually a surprisingly tricky card to build around. 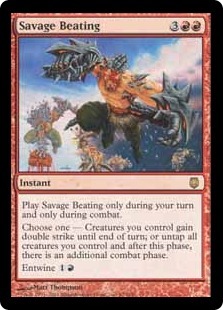 In Standard, one of the hallmarks of red-based aggro decks is they often tend to dump their hand on the battlefield pretty quickly. This means by the time we're actually dealing damage with Neheb, Dreadhorde Champion, it's unlikely we'll have that many cards in hand to power up its ability. On the other hand, it's also true that you don't really need to be using Neheb, Dreadhorde Champion like a Wheel of Fortune to make it good. As a 5/4 for four with trample, Neheb's stats are already solid enough that even if we are playing the legend fairly (for example, by using it to rummage away the land that we drew for the turn and adding one extra mana), it's still a pretty fine deal. Even just turning your single worst card into a random card from the top of our deck each turn is solid when combined with already reasonable stats. While being four mana still likely means that Neheb, Dreadhorde Champion isn't going to make the cut in mono-red (or mono-red splashing Cindervines) aggro decks, especially with Rekindling Phoenix in the format for the time being, it's possible a more interesting build develops that can take direct advantage of Neheb, Dreadhorde Champion's abilities. Perhaps the most likely hope for Neheb, Dreadhorde Champion is in a deck that actively wants to fill its graveyard. 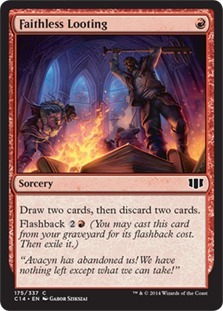 Thanks to Guilds of Ravnica, we actually have quite a few mechanics that use the graveyard. 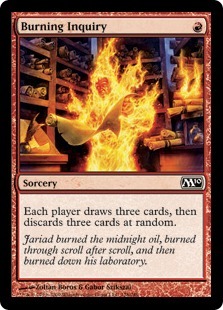 Discarding jump-start cards like Radical Idea and Chemister's Insight offers some extra value, while some sort of Jund Undergrowth deck could use Neheb, Dreadhorde Champion as a strong midrange threat that can stock the graveyard with creatures to power up undergrowth. While the curve is clunky, Neheb, Dreadhorde Champion could even be a good way to power up Crackling Drake, Enigma Drake, and Arclight Phoenix. And these options don't even consider going really deep and using Neheb, Dreadhorde Champion with cards like The Mending of Dominaria or World Shaper, or fueling graveyard shenanigans with cards like Squee, the Immortal, Desecrated Tomb, and Reassembling Skeleton. The biggest drawback of Neheb, Dreadhorde Champion is that it doesn't have haste. While "dies to Doom Blade" is a somewhat overused argument, it's also true that threats that cost four or more mana and don't do anything immediately can be a tough sell in Standard. In fact, out of the 50 most-played creatures in Standard, only one (Lyra Dawnbringer) doesn't offer immediate value (two if you count Niv-Mizzet, Parun, although in the worst case, you usually draw at least one card even if Niv-Mizzet, Parun immediately eats a removal spell) or have some sort of protection like Rekindling Phoenix. 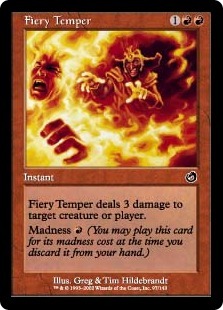 Paying four mana only to have your threat killed by Lava Coil for two mana is a big tempo swing in the wrong direction. That said, there are some tricks to minimize this downside. Domri, Chaos Bringer is an interesting option for giving Neheb, Dreadhorde Champion haste, as is Rhythm of the Wild. With Gruul Aggro catching on in Standard and one of the drawbacks of the deck being that it doesn't really have much card advantage to recover in the late game after a sweeper, Neheb, Dreadhorde Champion could show up as a one- or two-of in a Gruul shell. 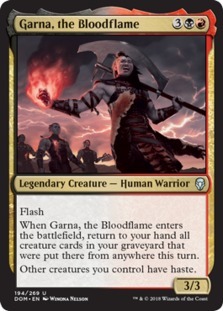 A far spicier (although likely less competitive) idea is Garna, the Bloodflame, which not only gives Neheb, Dreadhorde Champion haste but also combos with Neheb's discard, allowing us to return all of the creatures we discard to Neheb, Dreadhorde Champion's ability to our hand (possibly even using the mana we generate with Neheb to help pay Garna, the Bloodflame's mana cost). Let's start with the bad news: in terms of competitive tournament-style decks, Neheb, Dreadhorde Champion isn't all that likely to show up in Modern. 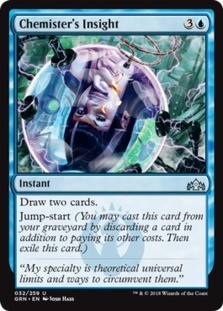 Four mana in Modern gets you cards like Jace, the Mind Sculptor. While Neheb, Dreadhorde Champion is powerful, it's nowhere near Jace powerful. As such, my guess is that Neheb, Dreadhorde Champion will mostly be ignored in the format. On the other hand, thanks to Modern's larger card pool, there are some sweet tricks and mechanics that work well with Neheb, Dreadhorde Champion. If I were building an Against the Odds deck featuring Neheb, Dreadhorde Champion in Modern, I'd start with the madness mechanic. Now, since I'm writing this article before the official rulings on Neheb, Dreadhorde Champion are published, there is some small chance I might be misunderstanding how Neheb, Dreadhorde Champion works with madness, but I believe that you can discard a bunch of cards like Fiery Temper, Avacyn's Judgment, and Stromkirk Occultist and then use the mana that Neheb, Dreadhorde Champion makes to play them for their madness cost, making Neheb, Dreadhorde Champion basically a one-card combo with red madness cards. Apart from madness, the problem with Neheb, Dreadhorde Champion is that Modern is pretty straightforward: while plenty of decks want to stock their graveyard, Modern is overloaded with much cheaper, more efficient ways to get the job done like Faithless Looting, Burning Inquiry, and Cathartic Reunion. 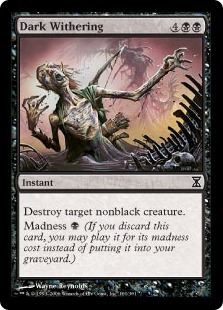 As such, most of the "this could work with Neheb, Dreadhorde Champion" ideas for Modern are basically just slower versions of things that people are already doing with other cards, like stocking the graveyard for Living End, getting dredge engines like Stinkweed Imp in the graveyard, or powering up Hollow One. While Neheb, Dreadhorde Champion can do all of these things, it's doing them on Turn 4 when Faithless Looting, Burning Inquiry, and Cathartic Reunion are doing them on Turns 1 and 2. As such, it seems that while Neheb, Dreadhorde Champion is powerful, it's likely just too slow for Modern outside of fun, Against the Odds–style semi-competitive decks. What about Commander? For this let's turn to resident Commander expert Tomer! Hey everyone! Seth kindly offered to let me contribute some early thoughts on how Neheb, Dreadhorde Champion could be played in the Commander format. 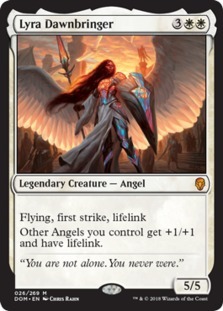 Thankfully it's easy for me to hype new Neheb because this card is AWESOME! At just 4cmc, Neheb provides an amazing looting engine that even provides you with extra mana in the process. All you gotta do is deal combat damage to any opposing player or planeswalker, which should be easy enough to do for a 5/4 trample creature. 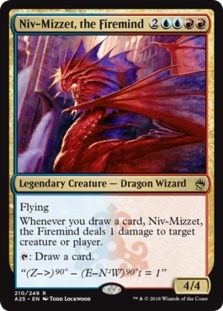 Wheel decks like Nekusar, the Mindrazer, The Locust God, Niv-Mizzet, the Firemind, and Arjun, the Shifting Flame are all about constantly discarding and drawing new hands with various Wheel cards like Wheel of Fortune, Windfall, and Reforge the Soul. There are two styles of Wheel decks, though both use all the previously mentioned wheel cards. 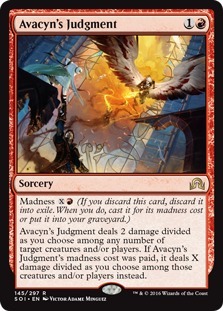 The first style uses wheels to draw as many cards as possible as efficiently as possible to deal tons of damage off Psychosis Crawler and Niv-Mizzet, the Firemind, make a swarm of locusts with The Locust God, or other payoff cards. The second style is more interested in capitalizing off the opponents wheeling, either by damaging them when they draw cards with Nekusar, the Mindrazer and Underworld Dreams, or benefiting when they discard with cards like Waste Not and The Haunt of Hightower. Some Wheel decks combine both styles! Neheb, Dreadhorde Champion fits right into the majority of Wheel decks, providing a repeatable wheel effect each turn with bonus mana to cast those newly drawn cards, all while growing your Chasm Skulkers and the like. There are lots of ways to take advantage of Neheb's card draw, but there are also some decks that can take advantage of Neheb as a discard outlet. Olivia, Mobilized for War is one such deck. 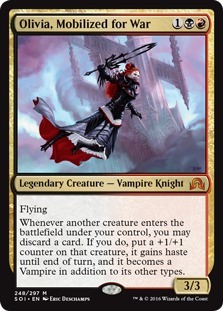 Poor Olivia was quickly overshadowed as a Vampire Tribal leader when Edgar Markov was released only months after her, but she's still a fantastic Vampire Tribal commander and one of the only Madness decks in the format, making her utterly unique as well. This deck turns discarding cards into an advantage largely on the back of the madness mechanic, which lets you cast the spell instead of discarding it, and usually the madness cost is even better than the regular cost. 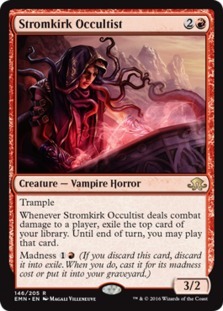 Discarding cards like Falkenrath Gorger, Stromkirk Occultist, and Dark Withering is amazing value. 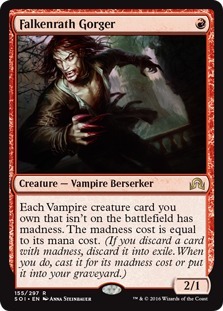 Neheb, Dreadhorde Champion is the perfect madness enabler for an Olivia deck and a perfect honorary Vampire — Olivia, Mobilized for War can turn him into a Vampire after all! If you're interested in this deck, I wrote a Budget Commander article about it a while back, so check it out! Typically when people think about Graveyard decks in Commander, the first colors that come to mind are a combination of Black with Green and/or Blue: Meren of Clan Nel Toth, Muldrotha, the Gravetide, and Sidisi, Brood Tyrant are popular choices. 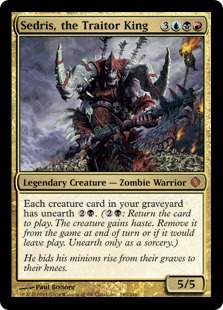 But Red also dabbles in the Graveyard archetype! Feldon of the Third Path, Alesha, Who Smiles at Death, Squee, Goblin Nabob, Garna, the Bloodflame, Sedris, the Traitor King, and Gyrus, Waker of Corpses all can benefit from how quickly and efficiently Neheb, Dreadhorde Champion fills the graveyard for us. As someone who has owned a Zombie Tribal deck for years, I can't wait to swap commanders from Varina, Lich Lord back to Thraximundar and try out Neheb! Attack, discard a bunch of Zombies, then use the mana generated to help pay for an Army of the Damned or Patriarch's Bidding? Yes please! 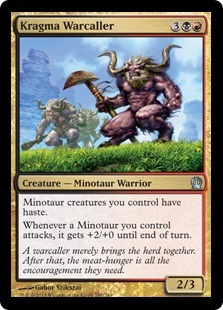 For the dozens of Neheb, the Worthy Minotaur Tribal players out there, I know it would be ba-a-a-ad manners if I didn't mention that Neheb, Dreadhorde Champion is also a Minotaur. Giving new Neheb first strike is very helpful in letting him survive combat and the looting can be useful for setting up a big reanimation spell like Patriarch's Bidding or whatever floats your goat before you lose to real decks. Just kid-ing. The final option is, of course, to run Neheb, Dreadhorde Champion as your commander and maximize the card's potential. 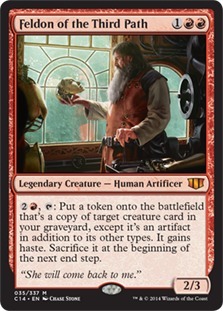 My first instinct would be to build a Voltron deck around him with a Graveyard subtheme: if we can't kill people with commander damage, we can instead reanimate some other beaters to finish the job. The key cards for this style of deck are extra combat steps: Aggravated Assault, Seize the Day, Savage Beating, Relentless Assault, etc. These cards double the damage output of Neheb, but also double the number of looting triggers we get. In fact, Aggravated Assault provides an infinite combo with Neheb, Dreadhorde Champion as long as we have five or more cards in hand. If we discard five cards to Neheb, we'll have the mana to activate Assault for another combat step and repeat the process. Even without comboing off, doubling our triggers can provide huge explosive turns as we fill our graveyard, dig for the cards we need, and generate tons of mana. We can generate extra Neheb triggers other ways, namely by giving him double strike: Fireshrieker, Blood Mist, Bererkers' Onslaught, and Assault Strobe do the job nicely. 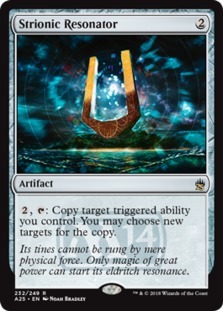 There's also Strionic Resonator which is more mana-intensive but also more flexible since it can copy any trigger! 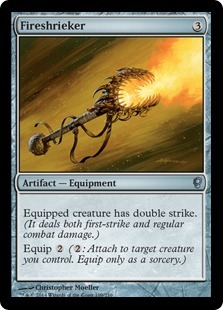 If we do run multiple double strike sources, then other cards with combat triggers get stronger as well: equipment like the Swords cycle (Sword of Light and Shadow) and Mask of Memory are twice as effective, as are creatures like Balefire Dragon. Finally comes our Graveyard subtheme. 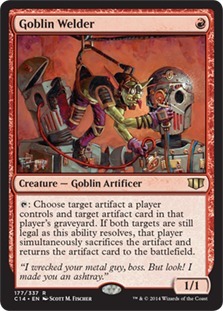 Mono-Red isn't known for its graveyard cards, but in fact it's got some great options, particularly if you're focused on Artifacts: Goblin Welder, Daretti, Scrap Savant, and Scrap Mastery are highly mana-efficient ways of getting back important artifacts from the graveyard, especially when you're sacrificing cards like Myr Retriever and Junk Diver to get them. 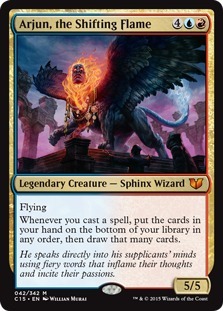 If you go for a more Spellslinger shell, we've got powerful options like Mizzix's Mastery and Past in Flames. For creatures, Feldon the Third Path is excellent and also overlaps with Artifact strategies. Other cards can fuel our discard engine. 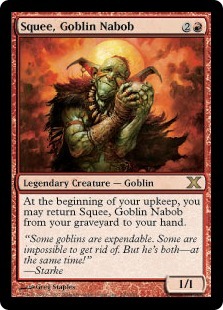 The greatest of them all is Squee, Goblin Nabob, which is a free discard that always comes back to our hand, my favorite of the bunch. 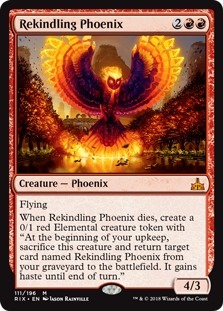 There's also phoenixes like Chandra's Phoenix, Flamewake Phoenix, etc. These ... aren't so good, but hey, they're there, which is something? Oh! 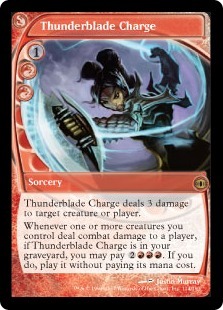 And there's Thunderblade Charge, a pet card of mine which I swear is actually kinda good at picking off utility creatures! Alright, here's a quick n' dirty sample decklist I slapped together. The idea is to pretend we're a grindy Artifact deck, ramping hard with mana rocks and getting back stuff that gets discarded or blown up by sacrificing Junk Divers to Goblin Welder cards. Creatures can come back as well thanks to Feldon of the Third Path and God-Pharaoh's Gift (flavor-win!). When we're ready to pounce, we get in there with Neheb, Dreadhorde Champion and string together extra combat spells and double strikes to dig through our deck and generate a ton of mana, winning with either Aggravated Assault infinite combats or just a big ol' Comet Storm. 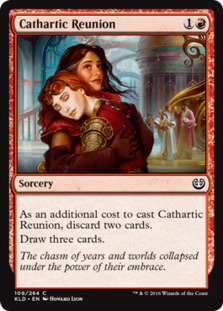 The deck is very resilient to removal since we have so much artifact recursion; only exiling our artifacts really hurt us. We have a ton of wheels to keep our hand nice and full and our graveyard packed with things to recur. We're fine playing the long game and have board wipes/spot removal to get us there, but Neheb is always ready to close things out. Alright, that's it for me! TLDR Neheb, Dreadhorde Champion good! Now back to Seth! So where does all of this leave us in terms of Neheb, Dreadhorde Champion? In Standard, people will at least try it. The stats are good enough on their own that it seems playable if someone can find a shell that really takes advantage of its abilities. While Neheb, Dreadhorde Champion seems unlikely to slot into the best red decks in the format, it offers a lot of potential with cards we already have in the format. 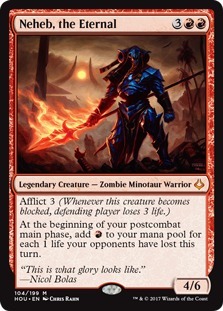 So while it might take some brewing to figure it out, I wouldn't be surprised to find that a Standard deck really wants some number of the Zombie Minotaur Warrior. 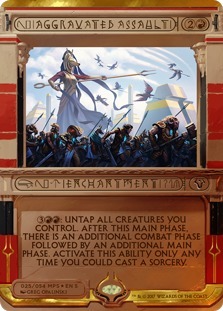 Meanwhile, in Commander, Neheb, Dreadhorde Champion lacks some of the brew-around potential you often want from your commander itself, but pretty much any red deck in the format will like the ability to rummage away its hand and make extra mana from the 99. Finally, in Modern, you can do some cool tricks with the madness mechanic (I believe), but in general, Neheb, Dreadhorde Champion is probably too slow to have a real impact on the format, especially since Modern Horizons is right around the corner. 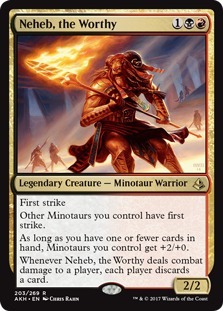 All in all, Neheb, Dreadhorde Champion is a worthy successor to Neheb, the Eternal and seems way better for Standard than any of the previous versions of Neheb. 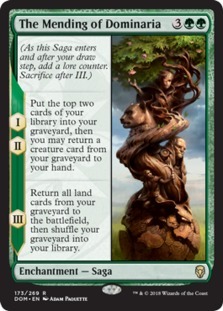 Whether this equals immediate success and playability remains to be seen—Standard is really large right now, so there is a lot of competition for each slot in each deck. 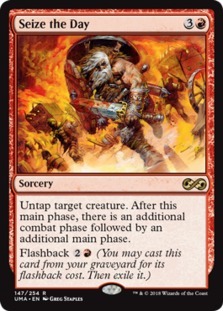 Worst case, Neheb, Dreadhorde Champion will be a card to keep in mind for after Rekindling Phoenix and the rest of the powerful cards from Ixalan block, Dominaria, and Core Set 2019 rotate this fall. Best case, someone figures out a way to break Neheb immediately, most likely with its ability to stock the graveyard at lightning speeds once it starts dealing damage, and Neheb, Dreadhorde Champion will become a solid Standard playable thanks to its solid stats and unique ability. Anyway, that's all for today. Thanks again to Wizards for hooking us up with an exclusive preview to show off for all of you today! What do you think of Neheb, Dreadhorde Champion? Where does it rank in the pantheon of Nehebs? Can it show up in Standard right away? What other decks, cards, and synergies can take advantage of Neheb, Dreadhorde Champion's unique powers? Let me know in the comments! As always, leave your thoughts, ideas, opinions, and suggestions in the comments, and you can reach me on Twitter @SaffronOlive or at SaffronOlive@MTGGoldfish.com.